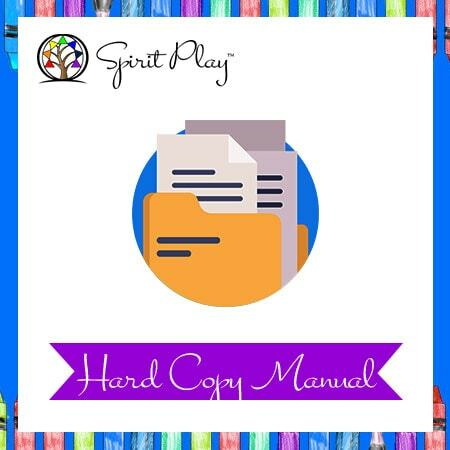 For the most comprehensive written information about how to run Spirit Play in your church, this manual has the answers for you. Some people prefer to read this before training, during their exploration phase while others purchase it after training to reinforce and fill in any gaps they might have. Even though this manual is written from a Unitarian Universalist perspective, any liberal religious education program could use this philosophy and the practical information to create their own programming. Note: This is printed and sent by a third-party (Lulu). Clicking this link will take you to their website. Part 1: Philosophy behind Spirit Play and its basis in Montessori and Jerome Berryman’s Godly Play™, in the story tradition, and in Unitarian Universalism, including why the arts are important to religious education. Part 2: Practical end of Spirit Play: how to get it started in your church, how to set up your room and choose your stories and art materials, and how to create a story basket. Part 3: Three fundamental lessons of our faith: The Flaming Chalice, The Promises, and the Sources. Part 6: Bibliography and resources to provide you with further reading and to help you find materials.